The year 2011 was a memorable one for the South Belfast pair of Oonagh McCullough and Fionnuala Toner and the Northern Ireland netball team, who reached the quarter-finals of the World Cup for the first time ever, in Singapore in July. The girls in green had agonisingly missed out on second place in April’s European Championships at Antrim Forum but came close to a top six finish at the World Cup – going down 46-41 to South Africa after a titanic tussle. 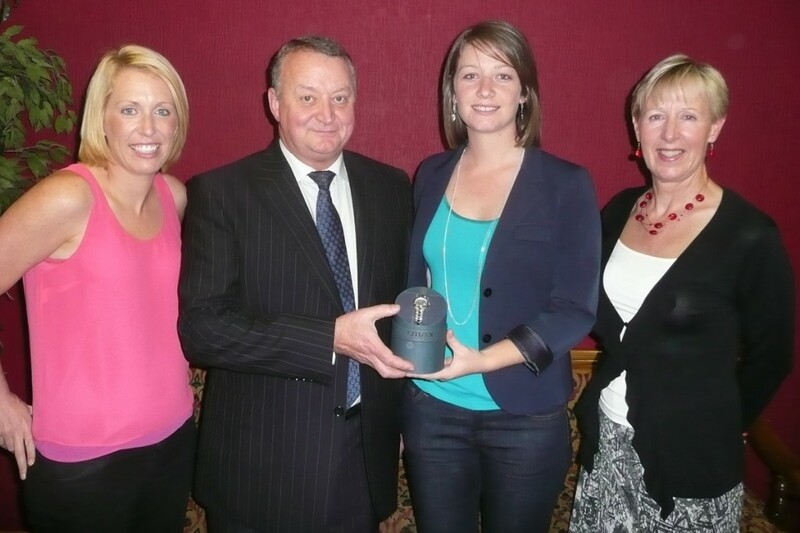 At an end-of-year dinner to celebrate the team’s achievements in 2011, McCullough is pictured receiving a Citizen watch from Alan Ferris, representing McNeilly’s Jewellers. Also in attendance are Northern Ireland coach Elaine Rice (left), a senior lecturer at St Mary’s University College, and Netball NI President Lorraine Lindsay. It was a particularly memorable year for Knockbreda woman McCullough who, as well as being acclaimed as Northern Ireland’s most improved player in 2011, graduated in Medicine from Queen’s University. Malone Road girl Toner, an Accountancy student at Queen’s, who is currently on a year out in the United States playing basketball, also established herself in Northern Ireland’s first choice line-up.